SimpleAgent™ is an easy to use, MS Windows based SNMP agent simulator that supports the MIBs you want with just a few mouse clicks. Given the SNMP MIB definition files, it can either create default variables (instances) on its own or learn variables from an existing agent. 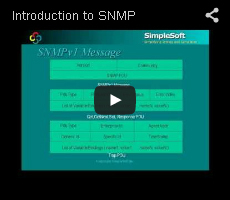 All SNMPv1 and SNMPv2C operations (Get/GetNext/GetBulk/Set/Traps/Notifications) are supported. SimpleAgent for NTCIP provides the same features as the standard version of the application with the added capability of communicating over a serial connection using PMPP as specified by the National Transportation Communications for ITS Protocol (NTCIP). The ITS Protocol support gives the engineer the flexibility of having a simulated agent that can communicate using either ethernet or a serial connection. The serial parameters and the PMPP parameters are fully configurable. Demonstration of capabilities of management applications in the absence of an agent at trade shows, customer sites or in training classes.